The composer Gerhard Wimberger, who has died at 93, was in charge of contemporary music on the board of the Salzburg festival during the late Karajan era, from 1971 onwards. Safe to say, nothing that he commissioned frightened the horses in the Reitschule. Karajan conducted one of his suites. Wimberger believed that Carl Orff and Arvo Pärt were proof that music need never stray outside the tonal frame. He was awarded the Austrian Composition Prize in 1967 and was professor of composition at the Mozarteum, 1969-91. He was also head of the rights collection organisation, AKM. ‘Safe’ composers can be found everywhere, and they don’t need to be ‘tonal’: Jörg Widmann, Olga Neuwirth, George Benjamin, Tom Ades, Pascal Dusapin, etc. etc. Interestingly, the notion of ‘safe’ music stems from the vocabulary of modernist ideology. ‘Good’ music is ‘cutting edge’, ‘transgressing boundaries’, ‘liberated from limitations’, etc. etc. which is describing ‘radical avantgarde’ who – with great courage and personal sacrifice – break down existing structures and exploring new territory. It is a romantic projection born from the Schoenberg circle, infused with quasi-scientific and quasi-philosophic theory. Looking through such glasses merely reveals materialistic phenomenae, and leaves-out altogether possible artistic qualities, which escape such rudimentary descriptions. 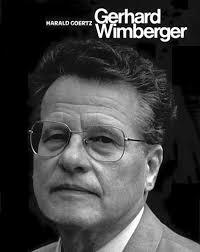 If Mr Wimberger’s works are boring, that has nothing to do with the type of language he used. Gerhard´s music was in no way boring. Sunsets are boring to some… who defines boring.? It is totally subjective. What the heck does ” safe pair of hands” mean? What a slap in the face… Salzburg mourns safe pair of hands! !